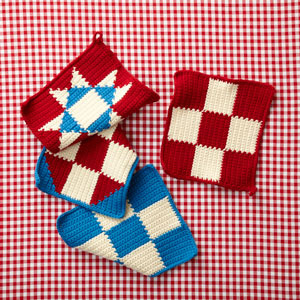 Crochet a fabulous pair of 4th of July potholders to celebrate the holiday. This free crochet pattern comes with four variations of the potholder. Make one or make them all. 18 sc + 17 rows = 4 in. (10 cm). BE SURE TO CHECK YOUR GAUGE. When you match the gauge in a pattern, your project will be the size specified in the pattern and the materials specified in the pattern will be sufficient. If it takes you fewer stitches and rows to make a 4 in. [10 cm] square, try using a smaller size hook or needles; if more stitches and rows, try a larger size hook or needles. 1. Yarn quantities listed are sufficient to make all four potholders. 2. To change color, work last st of old color to last yarn over. Yarn over with new color and draw through all loops on hook to complete st. Do not fasten off old color. Leave old color on WS of work until next needed. 3. Use a separate ball of yarn for each section of color. 4. Wind A into 2 separate balls, and wind B and C each into 3 separate balls before beginning. 5. Potholders can be made by following the written instructions or reading the Charts. 6. When working from chart, read RS rows from right to left, and WS rows from left to right. Row 1 (RS): Sc in 2nd ch from hook, sc in next 11 ch; change to C, sc in next 12 ch; change to A, sc in last 12 ch - 36 sc at the end of this row. Rows 2-11: With A, ch 1, turn, sc in first 12 sc; change to C, sc in next 12 sc; change to A, sc in last 12 sc. Row 12: With A, ch 1, turn, sc in first 12 sc; change to C, sc in next 12 sc; change to A, sc in last 12 sc; change to C in last sc. Rows 13-23: With C, ch 1, turn, sc in first 12 sc; change to A, sc in next 12 sc; change to C, sc in last 12 sc. Row 24: With C, ch 1, turn, sc in first 12 sc; change to A, sc in next 12 sc; change to C, sc in last 12 sc; change to A in last sc. Rows 25-36: Rep Row 2 twelve times. Edging: With A, ch 1, sc evenly around 4 sides of Potholder, working 2 sc in each corner; at end of rnd, ch 10 for hanging loop; join with sl st in first sc. Row 1 (RS): Sc in 2nd ch from hook, sc in next 11 ch; change to C, sc in next 12 ch; change to B, sc in last 12 ch - 36 sc at the end of this row. Rows 2-11: With B, ch 1, turn, sc in first 12 sc; change to C, sc in next 12 sc; change to B, sc in last 12 sc. Row 12: With B, ch 1, turn, sc in first 12 sc; change to C, sc in next 12 sc; change to B, sc in last 12 sc; change to C in last sc. Rows 13-23: With C, ch 1, turn, sc in first 12 sc; change to B, sc in next 12 sc; change to C, sc in last 12 sc. Row 24: With C, ch 1, turn, sc in first 12 sc; change to B, sc in next 12 sc; change to C, sc in last 12 sc; change to B in last sc. Edging: With B, ch 1, sc evenly around 4 sides of Potholder, working 2 sc in each corner; at end of rnd, ch 10 for hanging loop; join with sl st in first sc. Row 1 (RS): Sc in 2nd ch from hook, sc in next 10 ch; change to B, sc in next ch; change to C, sc in next 12 ch; change to B, sc in next ch; change to A, sc in last 11 ch - 36 sc at the end of this row. Row 2: With A, ch 1, turn, sc in first 10 sc; change to B, sc in next 2 sc; change to C, sc in next 12 sc; change to B, sc in next 2 sc; change to A, sc in last 10 sc. Row 3: With A, ch 1, turn, sc in first 9 sc; change to B, sc in next 3 sc; change to C, sc in next 12 sc; change to B, sc in next 3 sc; change to A, sc in last 9 sc. Row 4: With A, ch 1, turn, sc in first 8 sc; change to B, sc in next 4 sc; change to C, sc in next 12 sc; change to B, sc in next 4 sc; change to A, sc in last 8 sc. Row 5: With A, ch 1, turn, sc in first 7 sc; change to B, sc in next 5 sc; change to C, sc in next 12 sc; change to B, sc in next 5 sc; change to A, sc in last 7 sc. Row 6: With A, ch 1, turn, sc in first 6 sc; change to B, sc in next 6 sc; change to C, sc in next 12 sc; change to B, sc in next 6 sc; change to A, sc in last 6 sc. Row 7: With A, ch 1, turn, sc in first 5 sc; change to B, sc in next 7 sc; change to C, sc in next 12 sc; change to B, sc in next 7 sc; change to A, sc in last 5 sc. Row 8: With A, ch 1, turn, sc in first 4 sc; change to B, sc in next 8 sc; change to C, sc in next 12 sc; change to B, sc in next 8 sc; change to A, sc in last 4 sc. Row 9: With A, ch 1, turn, sc in first 3 sc; change to B, sc in next 9 sc; change to C, sc in next 12 sc; change to B, sc in next 9 sc; change to A, sc in last 3 sc. Row 10: With A, ch 1, turn, sc in first 2 sc; change to B, sc in next 10 sc; change to C, sc in next 12 sc; change to B, sc in next 10 sc; change to A, sc in last 2 sc. Row 11: With A, ch 1, turn, sc in first sc; change to B, sc in next 11 sc; change to C, sc in next 12 sc; change to B, sc in next 11 sc; change to A, sc in last sc; change to B in last sc. Row 25: With B, ch 1, turn, sc in first 12 sc; change to C, sc in next 12 sc; change to B, sc in last 12 sc; change to A in last sc. Row 26: Rep Row 11. Row 27: Rep Row 10. Row 28: Rep Row 9. Row 29: Rep Row 8. Row 30: Rep Row 7. Row 31: Rep Row 6. Row 32: Rep Row 5. Row 33: Rep Row 4. Row 35: Rep Row 2. Row 36: With A, sc in first 11 sc; change to B, sc in next sc; change to C, sc in next 12 sc; change to B, sc in next sc; change to A, sc in last 11 sc. Row 1 (RS): Sc in 2nd ch from hook and in each ch across - 36 sc at the end of this row. Row 2: With B, ch 1, turn, sc in first 12 sc; change to C, sc in next sc; change to B, sc in next 10 sc; change to C, sc in next sc; change to B, sc in last 12 sc. Row 3: With B, ch 1, turn, sc in first 12 sc; change to C, sc in next 2 sc; change to B, sc in next 8 sc; change to C, sc in next 2 sc; change to B, sc in last 12 sc. Row 4: With B, ch 1, turn, sc in first 12 sc; change to C, sc in next 3 sc; change to B, sc in next 6 sc; change to C, sc in next 3 sc; change to B, sc in last 12 sc. Row 5: With B, ch 1, turn, sc in first 12 sc; change to C, sc in next 4 sc; change to B, sc in next 4 sc; change to C, sc in next 4 sc; change to B, sc in last 12 sc. Row 6: With B, ch 1, turn, sc in first 12 sc; change to C, sc in next 5 sc; change to B, sc in next 2 sc; change to C, sc in next 5 sc; change to B, sc in last 12 sc. Row 7: With B, ch 1, turn, sc in first 12 sc; change to C, sc in next 5 sc; change to A, sc in next 2 sc; change to C, sc in next 5 sc; change to B, sc in last 12 sc. Row 8: With B, ch 1, turn, sc in first 12 sc; change to C, sc in next 4 sc; change to A, sc in next 4 sc; change to C, sc in next 4 sc; change to B, sc in last 12 sc. Row 9: With B, ch 1, turn, sc in first 12 sc; change to C, sc in next 3 sc; change to A, sc in next 6 sc; change to C, sc in next 3 sc; change to B, sc in last 12 sc. Row 10: With B, ch 1, turn, sc in first 12 sc; change to C, sc in next 2 sc; change to A, sc in next 8 sc; change to C, sc in next 2 sc; change to B, sc in last 12 sc. Row 11: With B, ch 1, turn, sc in first 12 sc; change to C, sc in next sc; change to A, sc in next 10 sc; change to C, sc in next sc; change to B, sc in last 12 sc. Row 12: With B, ch 1, turn, sc in first 12 sc; change to A, sc in next 12 sc; change to B, sc in last 12 sc. Row 13: With B, ch 1, turn, sc in first sc; change to C, sc in next 10 sc; change to A, sc in next sc; change to C, sc in next 12 sc; change to A, sc in next sc; change to C, sc in next 10 sc; change to B, sc in last sc. Row 14: With B, ch 1, turn, sc in first 2 sc; change to C, sc in next 8 sc; change to A, sc in next 2 sc; change to C, sc in next 12 sc; change to A, sc in next 2 sc; change to C, sc in next 8 sc; change to B, sc in last 2 sc. Row 15: With B, ch 1, turn, sc in first 3 sc; change to C, sc in next 6 sc; change to A, sc in next 3 sc; change to C, sc in next 12 sc; change to A, sc in next 3 sc; change to C, sc in next 6 sc; change to B, sc in last 3 sc. Row 16: With B, ch 1, turn, sc in first 4 sc; change to C, sc in next 4 sc; change to A, sc in next 4 sc; change to C, sc in next 12 sc; change to A, sc in next 4 sc; change to C, sc in next 4 sc; change to B, sc in last 4 sc. Row 17: With B, ch 1, turn, sc in first 5 sc; change to C, sc in next 2 sc; change to A, sc in next 5 sc; change to C, sc in next 12 sc; change to A, sc in next 5 sc; change to C, sc in next 2 sc; change to B, sc in last 5 sc. Rows 18 and 19: With B, ch 1, turn, sc in first 6 sc; change to A, sc in next 6 sc; change to C, sc in next 12 sc; change to A, sc in next 6 sc; change to B, sc in last 6 sc. Row 20: Rep Row 17. Row 21: Rep Row 16. Row 22: Rep Row 15. Row 23: Rep Row 14. Row 24: Rep Row 13. Row 25: Rep Row 12. Row 36: With B, sc in each sc across. They may be classified as potholders, but I think they would make an excellent 'patchwork quilt' afghan! Not to mention they are little and you can haul them with you to work on. How cute! !